Wow what a day today on Finnish Winer 2015! Today we showed only two girls, and judge Maria Markio from Finland loved them both. 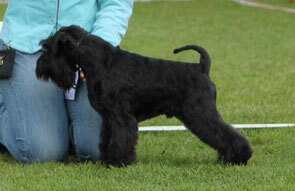 Raven's Tot Keen Sensation (Sandra), was BOB, Finnish Winner 2015, CAC -> FIN CH and CACIB!!! 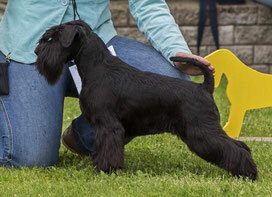 Raven's Tot Just Dance (Britney) in very short coat after puppies became 2nd female with res.CACIB. News from Seinäjoki Int show. Raven's Tot Knock-Out. 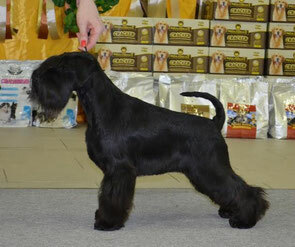 (Köpi) on his 2 years birthday got CAC, CACIB, BOB -> FIN Ch. Raven's Tot Listen To Your Heart (Liisi) - CAC, CACIB, BOS. Happy!!! Second day shows in Norway, and what a day! EDS 2015. 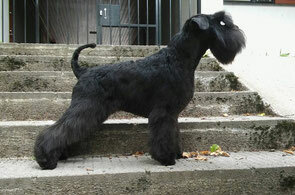 Judge Hans Lehtinen, 74 black miniature schnauzer entries. Raven's Tot Jive Me Crazy-exc. 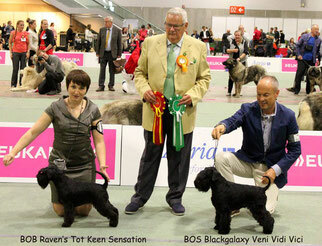 Raven's Tot Keen Sensation - European Winner, BOB,CAC, CACIB! I am over the moon! Congratulations, Tatiana! First day of shows in Norway. Norwegian Schnauzer and Bouvier club specialty in connection with EDS in Oslo. Judge in breed Rudi Hubenthal, in BIS - Ole Staunskjaer. 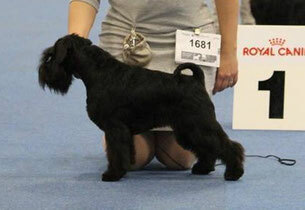 Our sweet Sandra (Raven's Tot Keen Sensation) BOB, BIS-4!!!!!!!! Saturday "Baltic Winner 2015, judge Sissy Adramitli, Greece. 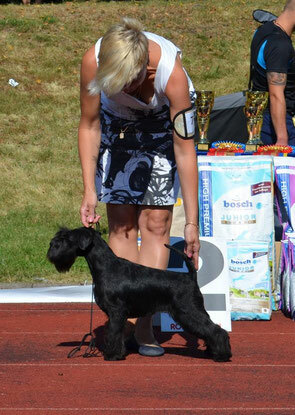 Sunday "Estonian schnauzer cup", judge Hilkka Salohalla, Finland. 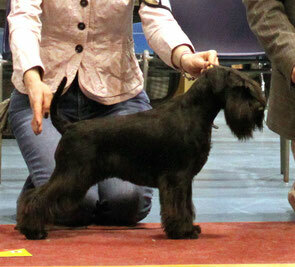 Raven's Tot Keen Sensation (Sandra) 3rd BF, res.CACIB/ 2nd BF, CAC. Well done girls! 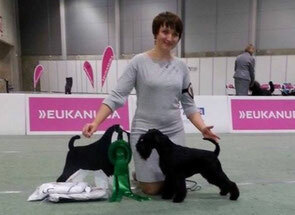 Specialty show, Judge Magdalena Kozlowska, Poland. 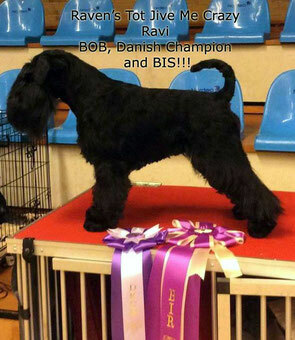 Ravi - Raven's Tot Jive Me Crazy was BOB, became Danish Champion and finally won BIS!!! 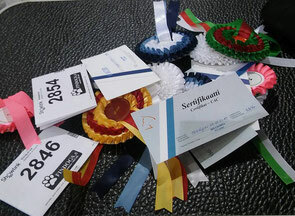 Eucanuba Int.Dog Show in Helsinki. Raven's Tot Listen To Your Heart (Panomaks Ultra Star x Natasha s Taganiego Roga) CAC, CACIB, BOS!!! 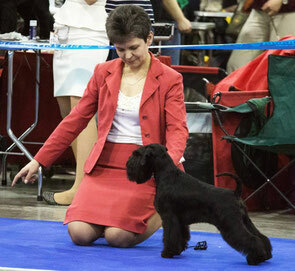 Int.Dog Show Belye Nochi in Saint-Petersburg. 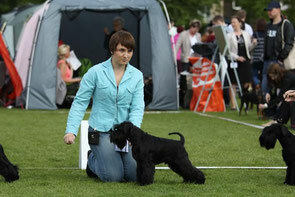 On this weekend in Saint-Petersburg were two international dog shows. Belye Nochi 1 and Belye Nochi 2. 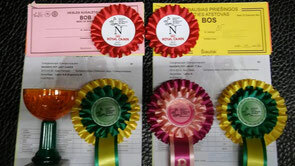 Our Sandra - Raven's Tot Keen Sensation took part in both shows. On Saturday judge was Revaz Khomasuridze. 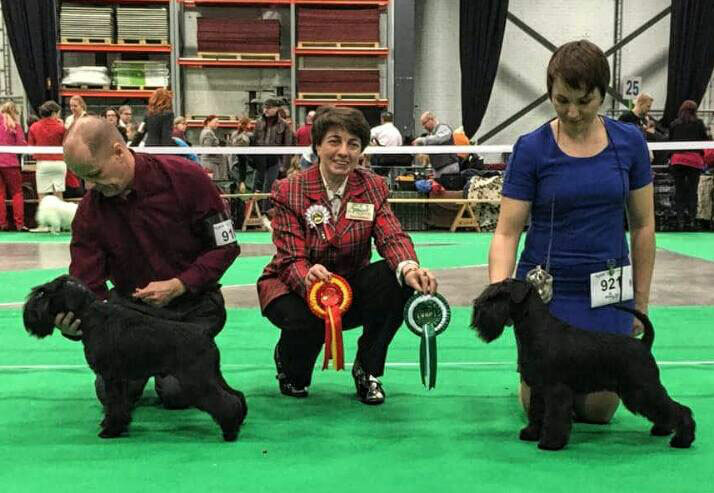 Our Sandra was Class winner with CAC and 2nd Best Female with res.CACIB -> CACIB. She got wonderful description, congratulations Tanja! On Sunday judge was Guido Vandoni. Sandra was class winner with CAC. With this CAC Sandra finished her Russian Champion title. Congratulations! 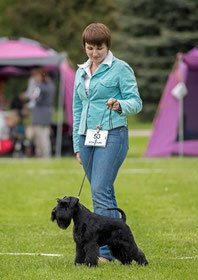 On Sunday in Tallinn was Schnauzer club specialty show. Judge Milda Baneviciute, who made us to run properly Hymiö smile . 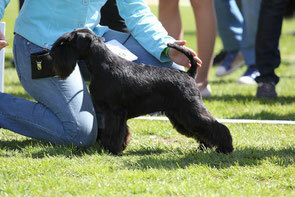 Raven's Tot Knock-Out (Köpi) won intermediate class and became 3rd best male, getting CAC and ISPU-SA. Congratulations Virpi and Karri! Thank you for pictures,Mira Sandström! 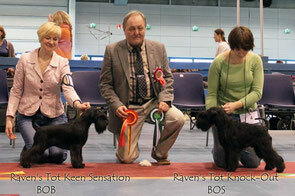 Raven's Tot Keen Sensation (Sandra) won intermediate class and became BOB!!! with CAC and ISPU-SA. Congratulations Tatiana! Thank you for pictures, Mira. Dog show in Siaulai, Lithuania. Dog show in Siauliai, Lithuania. Judge Valentin Fedorov, Belorussia. Raven's Tot Just Dance ( Britney) BOB CAC LT & BALTIC Champion! 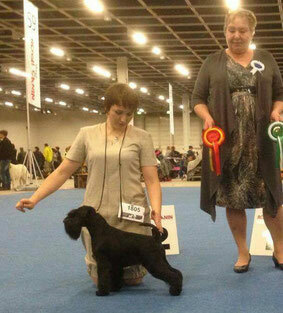 Sandra (Raven's Tot Keen Sensation) first time was in intermediate class. She got CAC, CACIB, BOS. Congratulations to co-owner Tatiana Gladyshevskaya. Groomer - Elena Zabruskova, photo by Elena Nikitina.